This individually hand-crafted Blank Stone is made of durable glazed pottery which can last a lifetime. At about 1.5 inches, it is sized to fit in a pocket, blessing bowl, or a faith chest. Purchase one or more to gift to others as a meaningful reminder of any special moment. This stone complements many of the Milestone Moments. It is also included in both the Blessing Bowl set for Congregational Milestones and the Blessing Bowl set for Meaningful Moments. 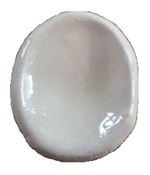 These blank white glazed stones are useful because they can be marked with a permanent marker to personalized any special occasion with a drawing or words. They can be used by congregations, families, or individuals to personalize and highlight any special event or celebration such as church anniversary, unique group or individual accomplishments, or achievement dates. This Blank stone for gifting is a wonderful keepsake to remember any unique and special celebration or occasion.